What’s it about? It’s the year 1415, and France and England have been locked in a seemingly-unending war for 80 years. In an academy for young nobles, the youths Montmorency, Richemont, Charlotte, and Philip bond, despite knowing their futures as leaders may force them apart. Montmorency in particular despises combat, and instead pursues alchemy in hopes of creating the Sorcerer’s Stone. He wants to use it to find a way to keep his friends safe, but creating it may end up being more than he bargained for. I was so ready to walk into this review spitting mad and decrying every person responsible for the mess. I wanted to descend with shrieking rage upon the very concept, and how it is contrary to everything Jeanne D’arc stood for in life. But you couldn’t even let me have that, Ulysses: Jeanne d’Arc and the Alchemist Knight, could you? Your first episode had to be inoffensive pap not even worth getting upset about. I’ve been fascinated by Joan of Arc since I did a report on her in elementary school, and I’ve always found the historical figure far more interesting than any fictional representation of her. What she accomplished—a young, illiterate peasant girl becoming a military leader and gaining the trust of the royal family—should have been impossible in her time. The English courts forced into a situation that would inevitably lead to her execution. She was truly an incredible person. So when I started seeing promos for this series that featured her alternately as a clumsy little girl and a scantily-clad sexpot, with a waterfall of saliva pouring forth as she locks lips with the male lead, I got mad. But Jeanne D’arc isn’t even in this first episode of Ulysses, which is the only thing I’m supposed to take into account when writing this preview guide. And the first episode is… fine. Inoffensive, even. It’s a fairly dull stock school story of friends saying, “Will we be friends forever?” and bonding and oh gosh, don’t they just know each other so well, aren’t they so close. And, if we’re just going by the first episode, there are even some things about it I like. Montmorency is the only boy in his group of friends, but it doesn’t come across as a harem. They’re all on equal ground, with stereotypical-but-distinct personalities. There’s no real reference or even implication that the girls are in love with him. It’s unclear how old they are—they appear to be right around puberty, but most of the girls have overdeveloped breast sizes for their apparent age. However, that too ends up called out. Charlotte, the bustiest one of them, sighs in frustration about how men are already starting to sexualize her at a young age due to her developing “womanly charms.” I remember having friends and classmates whose bodies started changing younger than average, and like her, they felt uncomfortable and frustrated with the way men were already starting to treat them. Despite their curves, there is little actual fan service as well. The girls are smart and, for the most part, capable of holding their own in combat—better than Montmorency, in fact, who is a bookish nerd more interested in alchemy than becoming a knight. 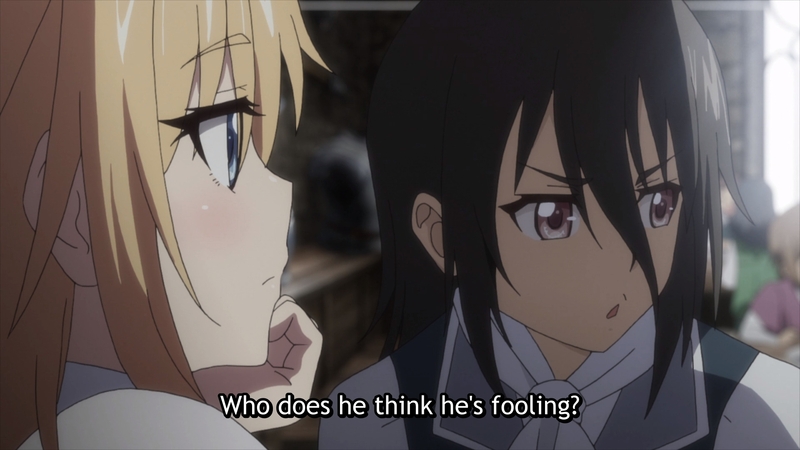 So, if we’re just going by the first episode and completely ignoring every single bit of promotion and word of mouth from people who saw the second episode at Crunchyroll Expo, Ulysses: Jeanne d’Arc and the Alchemist Knight does show some promise. It’s not good by any stretch of the imagination, but it’s generally inoffensive and treats its female characters well. If you watch the first episode in a vacuum. Which is what premiere reviews are supposed to do.